The symphony that is kedgeree…..
Friday night last week I indulged in a dish I do not often make but probably should as it is favourite of mine. It is one of those dishes that is great fun to construct – it is a coming together of several key elements – eggs, rice and fish – in a most blissful harmony that makes supper rather rapturous in a way one would not think plausible. Kedgeree is hundreds of years old as a dish – originally called khichri and there was no fish – it was chiefly a dish of rice and mung beans with butter eaten at breakfast. As the British Empire builders descended on India, they rather took to the dish and threw in some of their breakfast staples, boiled eggs and fish, creating more of what we now know as kedgeree – a British corruption of khichri. And it has all sorts of possibilities, like any curry dish or rice dish there are so many versions. This is my current favourite version. Hard boil the eggs for about 6 minutes – pop into a bowl of cold water to let them cool. Cook your rice and drain and rinse lightly in cold water. Then pop the butter into a large frying pan or sauté pan and once melted add the onion and garlic and fry over a medium heat until onions are soft. Add the garam massala, cumin seeds, mustard seeds, ginger, salt and pepper to the pan with the onions. Add the chill and the stalks of the coriander and stir fry for 10 minutes. Peel the eggs and quarter them. Prepare a saucepan with enough water to cover the haddock fillet. Add the bay leaves and peppercorns to the pan of water and poach the haddock for five minutes. Remove fish with a slotted spoon gently and set to one side to cool, then skin and flake the fish making sure there are no bones. Add the rice into the frying pan with the onions and spices, season and mix well. Add the juice of one and a half lemons and continue to cook for a few more minutes. Roughly chop the coriander. Sprinkle the turmeric and half of the coriander into the pan and add half the eggs and half of the flaked haddock too. Stir gently. Let it all warm through. Taste and adjust seasoning as you wish. Then add the rest of the egg quarters and the rest of the coriander and the lemon wedges. Pop the lid on and leave it to steam together and create the symphony that is kedgeree! Serve with natural yoghurt. You could use other fish if you like, smoked mackerel works, but I love undyed smoke haddock the best. You could also use curry powder instead of garam masala. Fiddling with this dish is what it is all about – but I love it as it is. Left Over Pot Roast Curry! Just didn’t want you to think any of Sunday’s marvellous pot roasted beef went to waste! I used the several remaining slices and some of the gravy stock for last Monday evening’s supper in the form of a warming, spicily unctuous beef curry. And the beef simply melted in the mouth! It had all sorts in – cumin,garam masala, curry powder, chilli flakes, mustard seeds, cardamom pods, curry leaves – all sizzled gently in butter with 2 cloves of garlic and phenomenally finely chopped onions. 2 tins of toms plus several tablespoons of the stock gravy from the pot roast were added plus the beef – I cooked it early at 5pm before I went out. Left it to coagulate in the most beautiful of ways – and warmed it up at 8pm when I got back and served it with cumin and turmeric rice. Delicious! A very simple curry….and no waste! And now the Paella recipe for Anna! A friend now dwelling in deepest Cornwall has just asked for the recipe for the paella below – how nice! Here you go young lady…though this is the full version – the poor man’s version enjoyed last night is basically without the chicken and chorizo – and using 100 gm of lardon instead – pan frying it first and then adding the peppers garlic etc and continuing from there. You can really add anything you want – rabbit instead of or as well as chicken, mussels, cockles…whatever is tickling your fancy that day or is lurking in the fridge. I use a Valencian paella pan – around £26-£30 on Amazon – or use a large sauté pan. Heat a good glug of olive oil and brown the chicken pieces. Take out and put on a plate to one side. Then pop in the chorizo and pan fry lightly for 2 minutes or so. Then add the peppers and garlic. Fry for another 5 minutes or so. Keep stirring all the time. Stir in the rice and let it toast lightly for 2 minutes. Now add the wine – have one for yourself too! Cook’s perks! Add the stock, the colouring – colorante – or the saffron, and the paprika. Bring to the boil gently stirring all the time. Let it bubble then return the chicken to the pan and reduce the heat to low. Simmer for around 15 minutes. Stir every now and then in between sips of wine. Put some music on! Add the peas next and cook gently for another 5 minutes, then add the prawns. Stir gently and leave for a further 5 minutes. Turn the heat off and let it stand for about 5 minutes or so. The rice should still have a little bite to it. 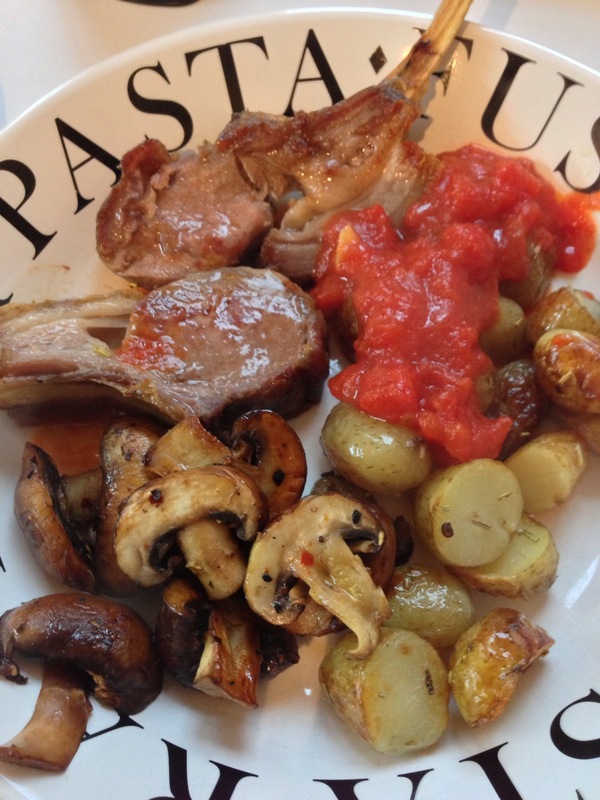 I adore this dish – ok…I will not rave on any further than I did yesterday! You get the picture! Enjoy, Anna, and anyone else who gives it a go – I am sure you all have a paella recipe like this – if not give it a go! I love this cut, and you will find other recipes using it on here. I often pan fry it and add cream for a quick dish, but last night I wanted something more mouth fizzingly filling. The result was, I have to say this, forgive me (often when I cook a dish I admit I like it or was happy with it) but this I absolutely adored. I mean, I sat there looking at the empty plate afterwards thinking – wow – that was an experience. I felt fulfilled in every sense. It hit every spot there is to hit. It happens only now and again that I cook a dish and I really, really am pleased with it – this was one. Often, I am left thinking – that was good – but….I could do this, I could have done that. It could be improved. Last night,however, I felt, unlike Mr Jagger, that I had just got satisfaction – big time. Please have a go at this. Tablespoon each of cumin seeds, fennel seeds and fenugreek. Pop all the ingredients numbered 1-4 in a shallow dish and add the pork slices – with you hands get them all coated as much as possible. In a small frying pan – add a little oilive oil and a little of the butter and fry the peppers and onions together gently until soft and the onions are starting to caramelise slightly – takes about 20 minutes. In a sauté pan, add the remaining butter and a good splash of olive oil. Once it is hot add the pork – fry for about 5 minutes each side – then remove from the pan and put on a plate to rest. Deglaze the pan with the white wine and then add the stock. Let it bubble for a while. Add the pork slices then the onion and pepper mix. Add the cream and leave to warm through for about 10 minutes on a gentle heat.You may want to add a little or less cream depending on your taste. It should now be looking simply glorious – like a Picasso or a Van Gogh! Swirls of colour! I served it with saffron basmati rice and at the last moment I add small windfalls of the fresh chopped coriander. By the way, I use a ceramic rice cooker – it never fails – one of my best buys ever, made by Queensberry Hunt. I hope if you ever get round to trying this dish you are as bowled over as I was. Go on…give it a go! You know when you come in from work and you stand in front of the fridge and you ponder for a second and think….hmmmm… what are we going to eat this evening? Then you remember..(hey it’s been a long day)….that you randomly bought a pack of free range thighs and chicken drumsticks at the weekend…and you have got some tikka paste left over from Sunday’s lamb dish. So….I marinated the chicken pieces in the paste. Left them for an hour in the fridge. I then put on Spotify and listened to a great new band called Peace and Love…then I opened a bottle of Shiraz and put on Bob Dylan‘s Modern Times…wonderful.The world was already looking better…. Ok…the chicken thighs and drumsticks went in the oven for an hour on 220c. I basted them after half an hour. Whilst I was listening to Bob, I decided to have a go at my very own Brinjal Bhaji. So- I sliced up, then chopped into cubes, one aubergine. I popped it into a pan of boiling water for 5 minutes then drained it. In a frying pan I decided to make a fine curry style dressing for it. I added a tablespoon of olive oil, then added a tsp of mustard seeds, a tsp of fenugreek seeds, a tsp of fennel seeds. I pan fried them for a minute or two – then tossed in the drained aubergine. I then added a tsp of garam masala and a tsp of mild curry powder. I chopped and deseeded a red chilli and a small orange pepper. I added them along with a finely sliced red onion. Turn up the heat and stir constantly until the onion starts to wilt. Turn the heat down, add a little rock salt and pop a lid on for 20 minutes or so, I cooked some basmati rice in my rice cooker with a pinch of turmeric to add colour, When all was nearly ready, I took the lid off the aubergine mix, added a knob of butter and a tbsp of crème fraîche. Leave on a low heat for a minute or two whilst you serve the rice and the chicken. Then add a good spoonful of the aromatic aubergine. This was a scintillating dish for a damp squib of a Tuesday. Oh yes…..back to my wine now…and Bob singing about the Mississipi….see you soon! I came home late this evening…tired and aching….and I took a back seat…my wife had decided to take over the cooking for a night. I sat in the garden, listening to the mid evening bird song, glass of Cabernet Sauvignon in hand and closed my eyes. When I came in, there was supper! I do all the cooking normally, but now and then, Jane does me her speciality – a risotto. I cook them too…but she does them better. We divide the labour well in our house and she is happy that I do all the cooking and food shopping – but it is bliss when she takes over and cooks one of her specials. Fry onions in half the butter til soft. Add rice and toast it well til it is sizzling and opaque. Then add the wine and boil for a minute to evaporate the alcohol. Start to add the stock. A ladleful at a time, stirring constantly and making sure the rice absorbs all the liquid before adding any more. The mixture will gradually become smoother and creamier. After 15 minutes or so, when the risotto is ready, add the chicken. Stir round for another 5 minutes. The rice should be still a little firm to the bite. Now stir in the rest of the butter, the rocket, crème fraîche and the parmesan. Add a little black pepper to taste. Take off the heat and leave to rest for two minutes. Serve to a hungry and waiting audience who will thank you lots and lots for cooking it for them!! Grazie bella! A fizzingly wet Les Miserables of an evening.only one thing to do – whack in a juicy rack of spring lamb from my good friends at Parsonage Farm. Ah, but as always, what to diddle with it? To my joy, there in the corner of the veg rack is a paper bag of gorgeous Jersey royals. I slice them all in half, parboil them for ten minutes then pan fry them in my wok in aromatic olive oil. The rack of lamb – I made a few slices in it, rubbed it with olive oil, salt, pepper and rosemary. 25 minutes sunning itself in the oven would do the trick. Feeling greedy, I took a bag of alluring chestnut mushrooms, pan fried them in chiili salt and oil. I had already put a pan of tomato sauce on – a green chilli – pierced – a clove of garlic – olive oil and a good 400gm of tinned toms. Cooked it for the time the lamb was in til it was mesmerisingly unctuous. 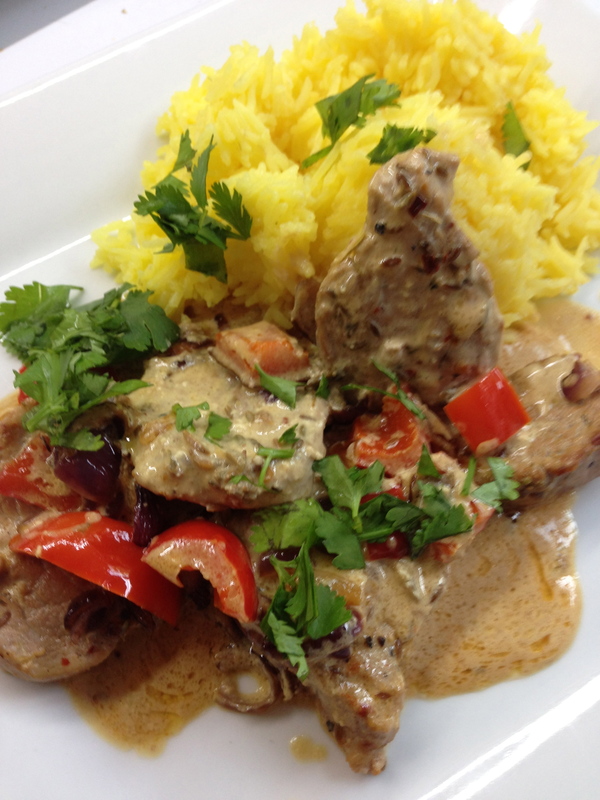 Served it all in a dish – pink fragrant spring lamb, so tasty my family were almost purring. A little Oasis in the background added a little more rock and roll and warmth to the evening. And of course a delicious bottle of creamy Cab Sauv. Oh..and I forgot to mention – whilst I was cooking, I fancied a tapas – there was a bowl loitering in the fridge of the leftovers from my wife’s excellent chicken risotto from last night. So – it called to me. 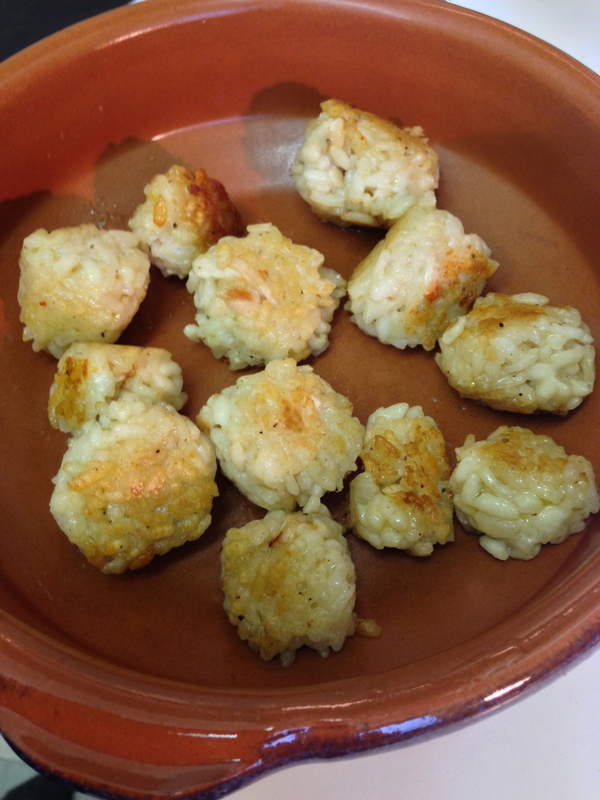 I rolled it into 12 little balls and pan fried it for a mock arancini starter – stunning with a crisp glass of white. It may have been raining outside – but in here – it was all sunshine, rock and roll, spring lamb and wine! Last night for supper, I wanted to use up some chicken left over from the Khao Man Ghai…and I also had a gorgeous cluster of heavenly coriander sitting staring at me from the kitchen window sill. 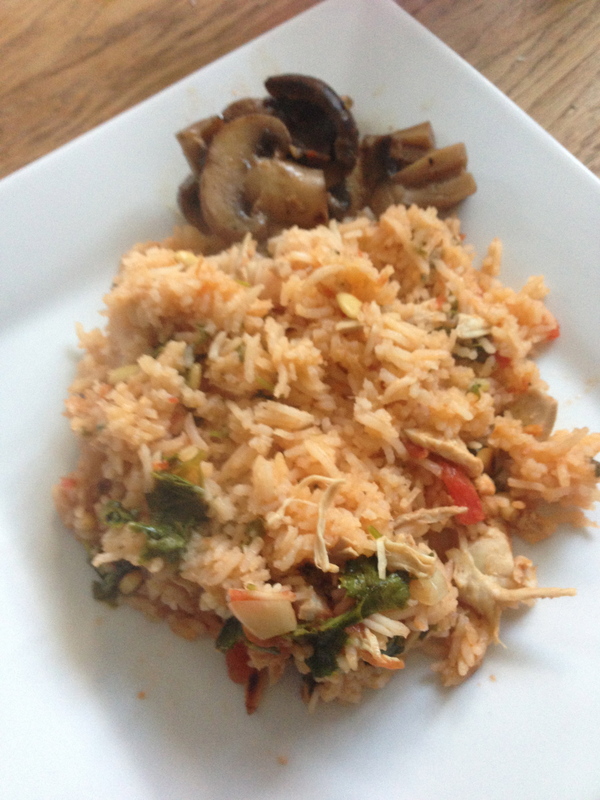 My kids fancied a risotto…but I had run out of risotto rice – poor planning there.. But I did have my usual large kiln jar full of basmati rice. The sun was still in the sky so I went into pilaf mode! I love pilafs and they are SO easy to make – and so versatile – just like risotto – but less fiddly. 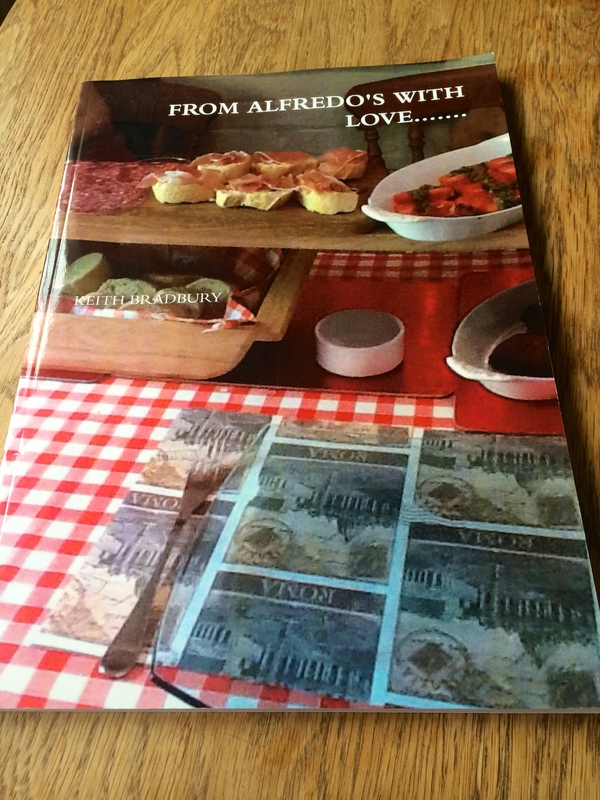 This is for 4 – though I recommend making more as it is it is moorish! Olive oil / 1 onion chopped finely or 4 small shallots/ 1 garlic clove chopped finely / 240 gm basmati rice – though long grain white is just dandy / 400 gm of good chopped tomatoes / pinch of sugar / 600 ml of chicken stock / left over chicken / bunch of coriander, chopped roughly / 2 tsp of pine kernels. Heat oil in a sauté pan. Add a splash of oil. Pan fry onion and garlic for 5 minutes until softened. Add the rice – no need to rinse first – cook for about 2 or 3 minutes stirring all the time to coat the rice. Add the tomatoes, the sugar, stock , the chicken and coriander plus a little black pepper. Stir once. Bring to boil, then cover the pan with the lid, and simmer for about 15 minutes until the liquid has been absorbed and the rice is tender – do not be tempted to stir! Toast the pine nuts in a dry pan and then add to the mix when the 15 minutes is up. Remove the lid – cover the pan with a clean tea towel – pop the lid back on and leave to one side for 10 minutes. Then lid off, tea towel off and stir lightly with a fork. I served it with lightly pan fried diced red chilli and chestnut mushrooms in butter. This is a dish you can play about with – experiment with different fresh herbs, meats etc. You can use prawns or salmon too…it all depends on what tickles your fancy….or what’s parked in your fridge! Ok , where were we…time to catch up after a fabulous Sunday. I promised Kay, a fellow blogger – find her at @whatscookingmum – this recipe. 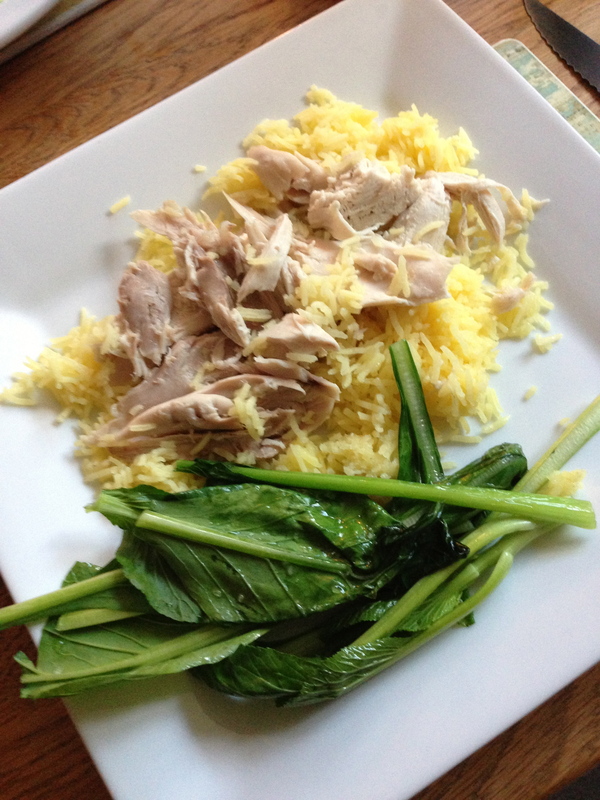 Here it is – a version of a Rick Stein recipe I saw years ago Khao Man Ghai…..that is…basically….poached chicken…but hey…what a poached chicken! 1.5kg free-range chicken / Freshly ground black pepper / 3 sticks of lemon grass, split / 5 garlic cloves a red chilli pierced / Small piece of ginger peeled / tablespoon of cumin seeds / 6 spring onions, trimmed or 4 small shallots finely chopped / Handful of roughly chopped fresh coriander. Pop the chicken in a large pan – I use a pasta pan. Pop half the coriander, half the onions, half the garlic and a stick of the lemon grass in the cavity. Then add the ginger, chilli, cumin seeds and the rest of the garlic, lemon grass, coriander and onions to the pan. Grind over lots of black pepper and a sprinkle or two of rock salt. Top up the pan carefully with cold water until it is completely immersed. Pop a lid on – bring to the boil..then turn down the heat very low and leave for an hour. When you take it out, be careful as you could end up with poultry carnage as the carcass will be close to falling apart. Transfer to a plate and skin. All of the meat will easily drop off the bone. This is a very, very economical dish as nothing is wasted. The stock can be used for a soup the next day. I served it with a saffron flavoured basmati rice and lightly stir fried choi sum in sesame seed oil…oh….and lots of different sauces e.g sweet chilli, plum. barbecue, hot chilli etc etc. 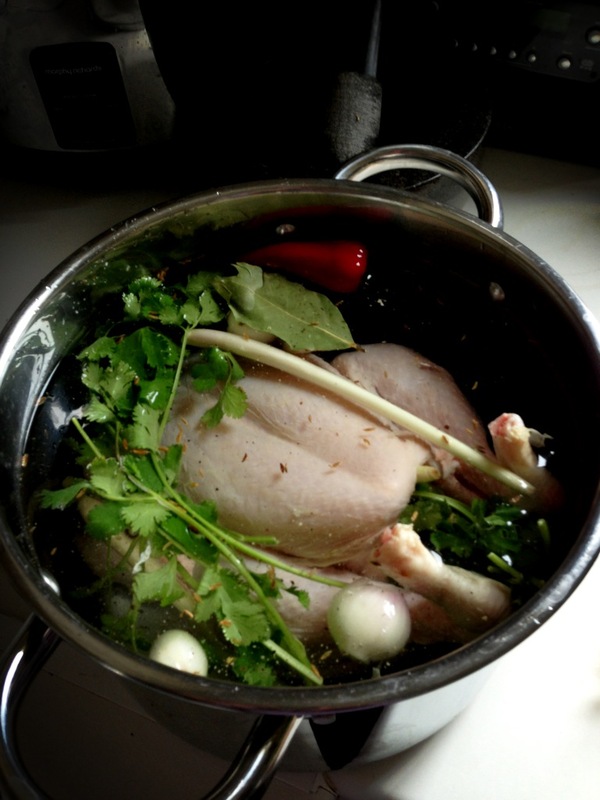 After you have piled some chicken on the rice, ladle over a spoon or two of the wondrous stock. You get the general drift. It is an absolute winner of a dish – a real gem. All the plates were cleaned within an inch of their pattern! Beware!